And we’ve (officially) begun! The first official day of CES 2015 was yesterday, and #TeamSpeck is here to bring you the details on everything you missed. Engadget shares their Day 1 roundup, highlighting a number of innovative new products from the show floor. We’re already eagerly waiting to purchase — playing with our pets while we’re at work and they’re at home? Sign us up! And we are already envisioning the E Ink color changing walls in the Speck office. CES 2015 brought good news to those who cringe at paying high cable bills each month, but just can’t cut the cord because they love live sports. Enter Sling TV, a CES-unveiled Dish service. Digital Trends calls it a “game changer.” For $20 a month, Sling TV offers ESPN, ESPN2, CNN, TNT, TBS, Disney Channel, ABC Family, Food Network, HGTV, Cartoon Network/Adult Swim and Travel Channel. Not to mention, subscribers will be able to access live feeds of the channels from most mobile devices, computers and devices like Roku players, Amazon Fire TV, Samsung and LG Smart TVs and Xbox One. Probably our favorite new product announcement? The Walkman is back! And while we would love it if our favorite accessory from the 80s made a comeback exactly as it once was, Sony has upped the ante with the Sony ZX2 Walkman. This $1,200 (yes, you read that right) music player is all about the high-resolution audio experience, amazing sound quality and WiFi/Bluetooth capabilities, 128 GB of storage, a touchscreen display and the ability to sync with speakers. Digital Trends has named their “Top Tech of CES 2015 nominees,” featuring what they consider to be the “best of the best” at CES 2015. Their editors hit the show floor and hand-picked favorites based on a combination of innovation, practicality and the “wow” factor in every category. Check out the nominees, pick out your favorite and revisit on Thursday morning when they announce the winners. CES 2015 isn’t just about amazing new products, either. Flipping to a more serious note, during his keynote, Intel CEO Brian Krzanich announced a diversity initiative, saying that the company intends to invest $300 million in diversity initiatives, including hiring, promoting and retaining more women and underrepresented minorities. The Verge shares more highlights from Krzanich’s keynote. At our very own booth you’ll find two of our latest in slim protection designs: MightyShell for iPhone 6 (as well as iPhone 5s/5), the 2x military-grade protective case that features our Speck-exclusive Radial Impact Geometry to withstand tough drops. 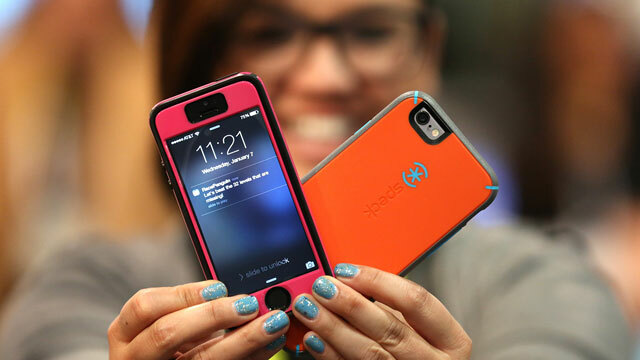 We’re also showing our latest iteration of CandyShell + Faceplate for iPhone 6 (also for iPhone 5s/5), which gives you all-around protection with a removable faceplate that uses TrueTap technology for a superior touch response. Plus, stop by between 11am and 5pm to snap a selfie with our photo booth- and don’t miss our happy hour between 2pm and 4pm every day! What new product or news are you most excited to hear about from #CES2015? Share below and don’t forget to stay tuned to Speck Buzz for all the breaking CES 2015 news!